Having attended last night's BU/BC final in the 2010 Beanpot Championship, I realized that the pro game is missing a number of things. And I'm not talking about chants (but they wouldn't hurt...more on that later). Bands. I'm talking about music. Not piped in top 40 or the same "pump me up" with Gn'R or Whitesnake. The brass section. Drums. The old Garden had the organ. An old guy stuffed into the corner of the building playing polka type songs and keeping the crowd going. Now it's all pre-recorded crap with no life in the sound. Fan passion. Now unless it's a playoff game and half the upper deck is hammered from drinking for three hours at the Fours, there's no passion. At the game last night everyone was into the game. Groans from BU fans as their players banged pucks off the post. Cheers from BC fans for a great move and the extra goal. Chanting. I told you I'd get to that. Like soccer fans in Europe with their own chants for their teams, last night's game had two great fan bases trying to out cheer the other. And it was great. BC had the bodysuit sperm guy while BU had everyone in their section wearing a hockey jersey. (A point that the future Mrs. WS made that all the BC fans just had stupid t-shirts..) Trading barbs back and forth in the best rivalry in college sports. Although BC won the game (and had the best chant with "Jesus Loves Us"), it was the passion that was in the building for a college game which makes me wonder if over paying for crap seats at an NHL game is even worth it anymore. Agganis Arena might be better. 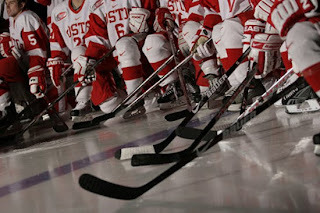 Blog disclosure: Due to marital obligations this writer is a BU Hockey fan. They call themselves Superfans? I only saw 4 people off-ice that were wearing jerseys. Almost every BU fan had a jersey. Pony up the cash, kids. This is absolutely true. There is not the passion for an NHL team that there is in college. It was the same situation at MSG when BU played Cornell, and they used to be rivals, but since BU left ECAC they do not play as much. NFL and college football are much closer when it comes to passionate fan bases. So it points to the fact that it is a lack or connection with NHL teams, not a college/pro situation. I find it. Talk about it. Type about it. You read. Comment. Discuss.